The purpose of the workshop was to develop collaborations between the Virtual Atomic and Molecular Data Centre (VAMDC) and the US atomic and molecular physicists and database developers. The meeting started at 9:30 (local time) on Monday, 27 Oct, and ended at 16:30 on Tuesday, 28 Oct.
NIST (National Institute of Standards and Technology), Gaithersburg, MD, USA, Room 215/C103. 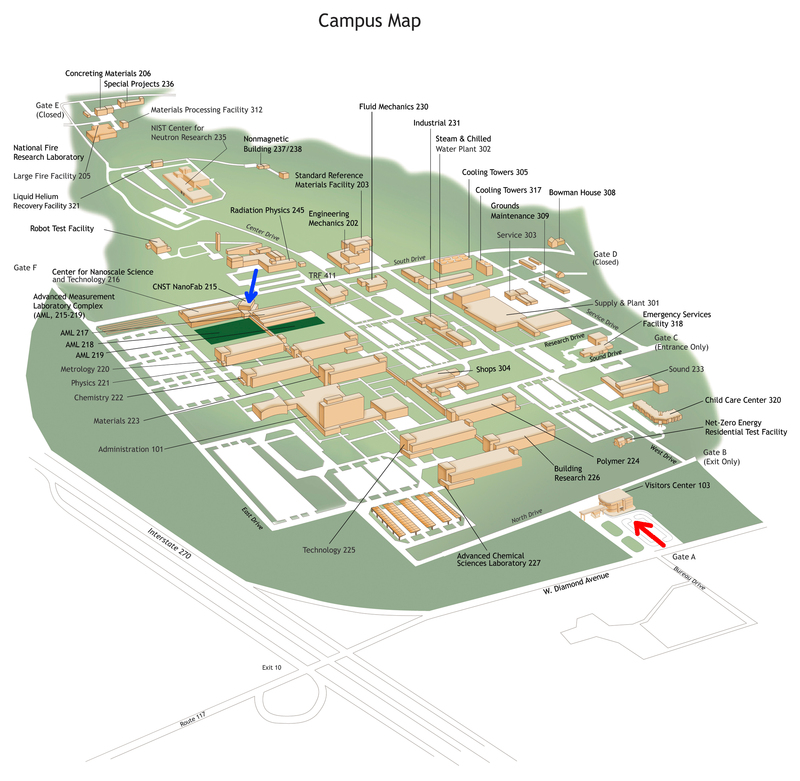 Participants from outside NIST should first proceed to the Visitor Center (red arrow on Map 1) to get their badges. Domestic visitors should check this link for VERY important information regarding acceptability of driver licenses (not all state licenses are accepted as valid IDs). After getting a badge, enter the main gate next to the Visitor Center and proceed to building 215 (blue arrow on Map 1). Parking lots are available nearby. Your paper badge will not let you in but someone will be waiting for you at the entrance to the building. Lunch is available at the cafeteria (Building 101 on the map) or outside the campus if necessary. There are many restaurants in the area.